TOFU MOM . . . and gravy! : Pierogies! 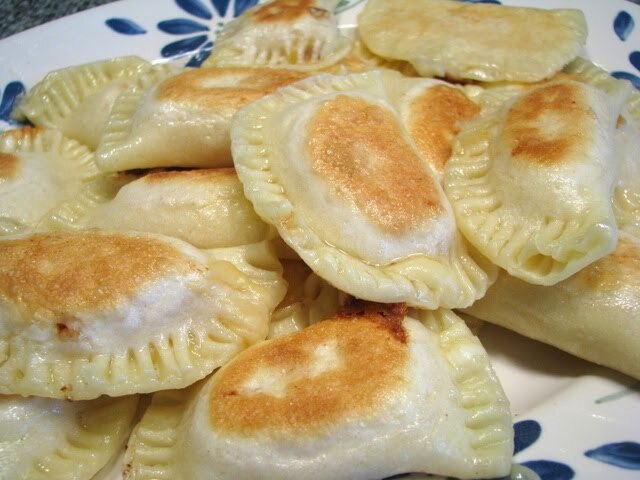 They're similar to the Ukrainian pierogy, but the Cheese Buttons of my childhood were much lighter, the dough more tender and they were filled with an altogether different, crumbly, onion-cheese mixture. I'm drooling right now. Nowadays when one of the Miller girls decides to reverently make a "batch" of Grandma's Cheese Buttons, we do so on a comparatively small scale (yet somehow, with three times the mess in our kitchens! ), and we ration the finished results quite sternly. No "dumpling-eating-contests" allowed! Grandma's "Cheese-free Cheese Buttons" I have not managed to perfect, yet, but a close cousin, the pierogy, is now a vegan-ized success in my kitchen! And since few people, (other than me, my sisters, my family, my relatives and the residents of South Dakota), will stress over the difference, I'll share my vegan pierogy recipe with you (because it's VERY good!) and I'll continue to try and perfect a vegan version of Grandma's Kase Knepfla. These take a while, but like any time-honored classic, they're so very worth it. While potatoes are warm, mash well and add remainder of filling ingredients. Mix well. While pierogi are cooking, saute 1 sliced white onion with as much margarine as you're comfortable using until onions are buttery and browned (these are comfort food - no one claimed they were healthy). **Optional: Some prefer to serve with sour cream (not my favorite but traditional for some, I guess) If you like Sour Cream, toss hot perogies and some sauteed onions in several Tbsp of Tofutti's Sour Supreme, add onion powder to taste and serve. Or: brown breadcrumbs in margarine and toss pierogies with crumbs. I looooove pierogies! I serve them boiled, with caramelized onions, diced apples, and a ton of salt and pepper. This version looks super... Now you've got me drooling too! I grew up in North Dakota - and had these often....LOVE them!!! And do you remember dumpling soup? With potatoes and of course dumplings? Seems like that would be easy to veganize also, if you had a "cream" product in your local store. I'll have to try that sometime. Thanks for jogging my memory about these! Whoa, those pierogies look SO good!